On this last trip to California we decide that, seeing as we were going to be there for so long (10 days), that we should take a day off from Disney, and visit another Southern California theme park, Universal Studios in Hollywood (well, technically Universal City, but who's to know?). It had been a very long time since either Jon or I had been to Universal in Hollywood, and we had been eager to visit for quite some time. 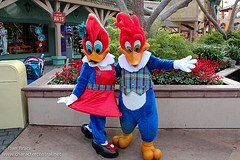 You may recall that we had made a similar decision to visit Universal Orlando Resort back in September, when we had made our extended trip to WDW. You can read about our two days there, by clicking here. It might help to give you some perspective when I compare and talk about things from this experience. Loren picked us up at our hotel, and we left early enough that we arrived there with no traffic problems, not too long after the park had opened. Hours this past weekend were 8am to 10pm. Loren had commented that, he being an AP holder at Universal, found it unusual but good that the hours were quite so long. Anyway, we arrived in Universal City, and proceeded through their parking system. Like Disney, the Universal resorts charge a lot to park. Universal also offers preferred parking at an extra cost. Loren's AP gave us free parking, and we decided to pay the extra $10 for preferred (note that it is usually $5, but this was a holiday weekend. Sigh). Universal is set up in the hills, north of Los Angeles, and you find that it is an interesting place to navigate, with its slopes and hills, and winding roads. It is pretty though, and the park has some great views over the valley. Like Universal Orlando, parking is in large parking structures. The preferred parking garage is situated, rather unusually, embedded in the hillside, basically under the western part of the theme park. The other regular garage is further out, past City Walk. So, we parked, and made the very short walk to the main entrance. My immediate thought was how incredibly compact the entrance was compared to Universal Orlando. Security, City Walk, ticketing, the turnstiles and the bus depot were all right there, as was the famous rotating globe. Loren's AP allowed us to get 15% off of our entrance ticket price, making them $68 each instead of $80. Through the famous archway we wet, and found ourselves in the main entrance plaza of the Upper Lot. Universal is divided into three main areas, with a few small sub areas. There is the Upper Lot, the Backot (tram tour) and the Lower Lot. The Upper Lot contains the vast majority of the park's attractions, retail locations and entertainment. The entrance area proceeds down a street that has a bunch of stores and eateries. Then the park opens up into what I can only really describe as what would be an open area filled with random buildings! There doesn't seem to be any real layout or fluidity to the Upper Lot area, which can make it a little confusing to walk around. There aren't really too many attractions at Universal Studios, as they are limited for space, and the main draw here is the studio tram tour. They have some things that Orlando have, but no unique attractions (except the tram tour). 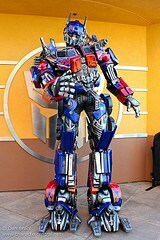 Our main concern was to experience the tram tour, and Transformers. Of course, we decided to eat first, as it was breakfast time. We chose a place right near the entrance called Hollywood Grill. Unfortunately this turned out to be quite a bad decision! For some reason, despite being a theme park fast food place, our order took half an hour, and there was only one guy working the serving area. By the time we got to sit and eat, out food was nearly cold. So off we went to guest relations. Half an hour later still, and after much explaining and waiting around, we eventually were given vouchers to the value of what we had spent at the grill, to use for lunch or dinner at the park. The really odd thing about complaining at guest relations was that at first we were told they "do not deal with retail problems". Well, what do they deal with then?! So they had to call a restaurant manager. Weird. As well as the "refund", we were given two front of line passes, to use at any two attractions to allow us to get to the front. It was early when we arrived at the park, and it stayed fairly calm for quite a while, before getting busier later. We managed to ride Transformers with no line at all. 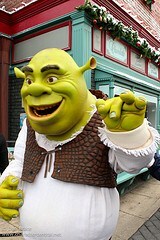 I have to say that it is an awesome ride, and when it opens in Universal Orlando we will be visiting there again. Oddly enough though, it is an exact replica of the absolutely incredible Spider-Man ride in Universal Orlando's Islands of Adventure - except it is themed around Transformers! The ride system, layout, and even the scenes are practically identical, except instead of Marvel heroes and villains, you see Autobots and Decepticons. I didn't have a problem with this though, as it does work well, but I thought it was an interesting point to note. Once it opens in Orlando, anyone not quite so hot on realising these things, and the causal visitor experiencing both attractions in one trip, will probably get a strong sense of déjà vu, and won't realise why! Outside the attraction they also now have Optimus Prime and Bumblebee as meet 'n' greet characters, much to Jon's delight! You may recall my ridiculous level of excitement back in September when I got to meet the Turtles, well now it was Jon's turn! They looked really cool, and are incredibly well designed. 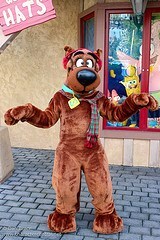 Woody, Winnie, George, Fievel and Scooby were all wearing special Christmas outfits, which was nice to see. 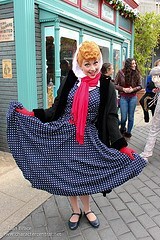 Lucille Ball had a winter outfit too. The Grinch was also wearing a Santa outfit, and in Hollywood is a face character that speaks, unlike Orlando's cartoony "fur" character (I guess it's the same difference as DLP having face character fairies, but the Asian parks being fur... odd). Max the dog was a real dog, and I am not sure if that counts as a real character really! Nonetheless, he was very cute. 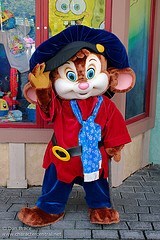 I was really excited to meet Fievel because I have always loved him! Loren informs me that Fievel is like the Pluto of Universal Hollywood, and can always be met, no matter the location or occasion! Loren informs us that they also sometimes have Shaggy and Daphne, Crash Bandicoot, the Lorax, Doc Brown, and until recently, the ParaNorman characters out in the park. We didn't see any of these this past weekend though, sadly. They had a good amount of live entertainment randomly around the park too. The Blues Brothers regularly rolled out in their car, and played some tunes, and there was a stage set up, where we saw a live band playing a few times as we walked by. One thing they also do that I have never seen Orlando do, is they have performers in the windows along the streets that have building facades. For example, along the London street there were carollers in the windows above. We also saw some "citizens" up in the windows above the candy store. I thought that this was a neat idea, and adds to the atmosphere. Down on the Lower Lot, next to Transformers, they have a small exhibit that pays tribute to Universal's long history and showcases props and memorabilia. I was pleased to see that they had some ParaNorman sets pieces and character models in there. If you haven't seen ParaNorman, then I recommend it. Throughout the day we were able to to get refills of drinks in a cup that you can buy. Universal sell large cups for $8.99, and for 99c you can refill not just all day, but any day! Loren regularly takes his with him. In the long run it definitely works out a good deal. I also saw that certain cart locations also offered free popcorn refills on the same day after initial purchase, which I thought was nice. Now we come to the main attraction at Universal Hollywood, the tram tour. For you Disney fans out there who have never been to Universal Hollywood, but who have experienced Disney's own versions at WDW and DLP, all I can say is, do not judge Universal by the same standard! The Disney tram tours are pretty dire. Universal's tour is something to really write home about. 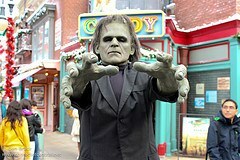 The tour takes about an hour, and incorporates much of the actual Universal Studios sets and filming locations. You can be lucky enough sometimes to actually pass by big name productions while touring the lots. That is what makes the tour especially different - knowing it is all real and functional. A lot of you will almost certainly recognise some of the sets they have, from your favourite TV shows. What makes the tour even better is that they do also include some fun "ride" elements. You experience an earthquake and a flash flood, and get attacked by Jaws, King Kong, dinosaurs and even Norman Bates while riding around the studio! 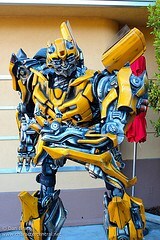 It's really cool, and definitely the main reason to visit Universal Studios. Being Christmas season, Universal Studios celebrates in their own unique style. 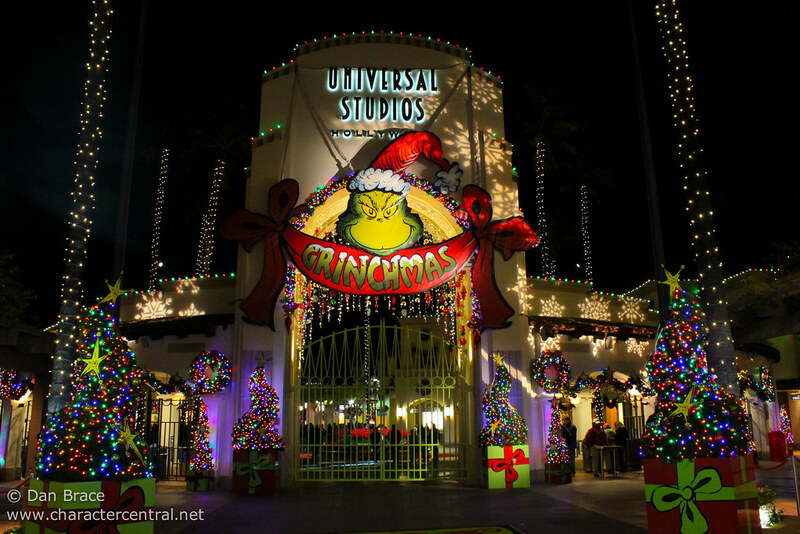 Universal have produced some of Dr Seuss's work as movies, including The Grinch. So, what better way to celebrate than with Grinchmas?! The reason I mention this with the tram tour is because during the tour you pass by the actual set from the movie. 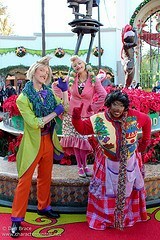 It is there all year round, but for Grinchmas they bring it to life during the tour with a short show stop! Your tram stops in front of the set, and the citizens of Whoville appear, including the Mayor, and of course The Grinch himself! It literally lasts minutes, but it's a cute idea, and definitely adds a nice touch to the tour. The tram tour is really what sets the Hollywood park apart from the Universal Orlando parks. Universal Orlando have the bigger, better rides and shows, but if you really want to experience the real Universal Studios beyond just a theme park, you have to come to Hollywood. For Grinchmas they also have a tree lighting ceremony several times per night. We used one of our front of line passes as to avoid the long wait, and ended up walking straight into the 7pm show with no wait, and getting good seats (we had used our other pass from gust relations to get onto the tram tour, as that had a 70min wait). The tree lighting features a reading of the classic story (usually read by a celebrity. Ours was somebody I had no idea whom they were lol), followed by a short show featuring the Grinch characters. The show basically involved the citizens of Whoville having to give their yearly award to someone, and Cindy Lou chooses the Grinch, for reasons never explained. The Grinch arrives, having already stolen Christmas, but is warmed by their generosity, and has a change of heart, restoring Christmas, just in time! The tree lighting show is really pretty, and the huge tree looks very festive at night. While we are talking about Christmas/Grinchmas season, I shall mention the other things offered at the park. Obviously there is the tree lighting show, but that is set in a separate area, that during the day is also a winter play area, filled with tons of fake snow! 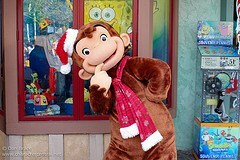 Then of course as I mentioned before you can meet the Grinch and Max (at two locations actually! ), and let's not forget the mini-show during the tram tour. There are also decorations throughout the park, mainly themed to the Grinch. Also, you may recall from my character list earlier in this report, I said that some of the park's characters appear in winter costumes. I really liked everything that they offered for Christmas overall. I feel that they had enough to see and do given the small size of the park, and the decorations and lights were pretty, especially at night. For dinner we used our $60 worth of free food vouchers to go a bit overboard at Mel's Diner, located on the "American" Street (although this street only really consisted of two small facades). We got our food quickly, and it was fresh and hot, but then we had to wait 15 minutes to pay! 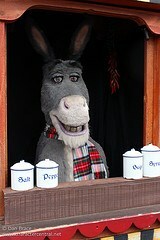 At dinner time, when the restaurant was very busy there was one cast member working the cash register! Argh! It felt like breakfast all over again! 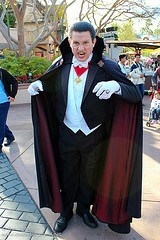 Why were Universal so badly understaffed on a holiday weekend at their main dining locations?! It simply didn't make any sense. Finally, once we had paid, and found a seat (easier said than done - lack of seating being another issue at the park), we eventually ate. The food was pretty good though, despite having gotten a bit cold while we waited to pay! When we had been in Universal Orlando in September, things had seemed so much easier, dining especially. I wonder why the diference? It's not just the dining that is more chaotic in Hollywood either. Meeting characters also seemed a bit more hectic, but, I will say that as per our experience at Universal Orlando in September, characters are overall easier to meet than at Disney, and seem to be out more frequently, for longer and are more accessible. We did also venture down in to City Walk for a short while during the day, and both Jon and I really liked it. I think Jon liked it more than the one in Orlando. Me personally, I thought they about evened out. There was a good variety of stores and restaurants, and it has a more upbeat feel than the Downtown Disneys (or equivalents) around the world. So, we come to the end of our day at Universal Studios Hollywood, and I have to say that we really enjoyed it. As with when we went to Universal Orlando from Disney in September, we enjoyed this break away from Disney mid-trip. I won't claim that Universal Studios is the most thrilling place on Earth, and it does lack in the attractions department, but, if you're looking for a fun filled day up to Universal City, then Universal Studios fits the bill!